Arsenal vs Atletico Madrid – Arsene Wenger is finally leaving Arsenal but scarcely seems best pleased at the messy, rather unseemly end to his 21-and-a-half year reign in north London. What better way, then, to fire a message to the watching world that he is from finished as a top boss than by masterminding a victory over two legs against Atletico Madrid in the Europa League semi-finals. The first leg is this Thursday at the Emirates and that should at least give the Gunners a chance of getting a lead to take into the away meeting a week later. 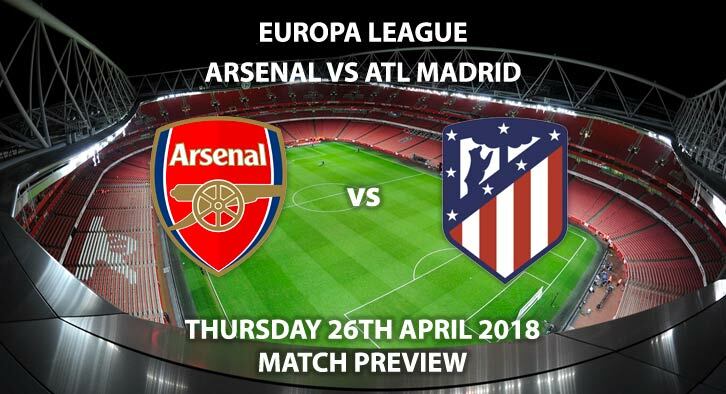 Atletico Madrid, managed by a contender for the Arsenal hot-seat Diego Simeone, are strong favourites – not only to beat the north Londoners but lift the trophy outright for the third time. They are currently second in La Liga, 11 points adrift of leaders Barcelona but four clear of Real Madrid. They may have performed poorly in the Champions league group stages, finishing third behind Roma and Chelsea, but they have recovered well since. Under Simeone, the club’s record in Europe is impressive. They were twice runners-up to Real Madrid in the 2014 and 2016 Champions League finals, while in the Argentine coach’s first full season in 2011-12, they won the Europa League. Whatever happens in the next few weeks, Atletico are certain to be in Europe’s elite competition next term. Arsenal, by contrast, are slumped in sixth place in the Premier League. Their only hope of ensuring Champions League football for Wenger’s successor is by winning the Europa League. But Wenger, 68, has never won a European trophy in his career. He has lost two finals as Arsenal boss – the 2006 Champions League and the 2000 Uefa Cup. He was also a runner-up in the Cup Winners’ Cup in 1992 as manager of French side Monaco. As Gunners boss, though, his record in semi-finals is pretty good. In 21 to date, both domestically and in Europe, the Frenchman has been a winner in 13. In his three European semis, his only defeat was in the 2009 Champions League. Home win: Despite being underdogs, Arsenal are in good form at the Emirates. They have won six in a row in all competitions, including beating AC Milan and CSKA Moscow in their previous Europa League ties there. Atletico, on the other hand, have been inconsistent of late. They have won only once in five games – and have not won away in four. Their last success on the road was the 5-1 second-leg thrashing of Locomotiv Moscow at the last 16 stage. Goalscorers: Atletico’s Antoine Greizmann has 27 goals this season, six in the last nine, and two in four Europa League appearances. Former-Chelsea striker Diego Costa is in the squad but not expected to be fit enough to start. Arsenal playmaker Aaron Ramsey is in top form, having scored eight in his last nine appearances, including four in his previous three Europa League outings. French referee Clement Turpin has shown 53 yellows in his 15 Ligue 1 games this season, an average of 3.53. He has shown two reds. In five Champions League games, he has produced 17 yellows but no reds. Correct score, Arsenal 2-1 – (link no longer available). BTTS and Arsenal to win – 4/1. RequestABet upto 10/1 – BTTS, 4+ Corners each team, and 30+ match booking points – 7/2. Odds and markets last updated on 26 April 2018 @18:15 GMT. Markets will unlikely be updated ahead of kick off. Keep visiting the tips and preview area for further updates and betting previews for more previews for this upcoming weeks European, FA Premier League and SkyBet Championship action.